Trying to balance between work, being a wife, taking care of my very sick mother & attending all of her chemo and radiation treatments proved to be very difficult. Fast food was the easiest thing to grab while on the run, I used food as my crutch any time I felt the stress to be too overwhelming. I figured "It's okay, I'm pregnant, I'm eating for two." Ha, ya right! We all knew I was delusional. But in my past I had never had a hard time losing weight so I figured "It will all come off after the baby is born." Yet again, delusional. I turned to eating yet again. None of it is an excuse, I was simply careless. I ever imagined. It took me a long time to accept my "new" body and all of the changes that come along with motherhood. I refused to buy new clothes and wore out the welcome of my maternity jeans. Were talking 6 months + postpartum. Eek! I was frustrated with myself. "Why isn't the weight just coming off like it used to?!" "How did I let myself do this?!" I just wanted to stay in my home, in sweatpants & hide away from the world. Some of those emotions may have also been grief from losing my Mother, but mainly, I just didn't want anyone to see my "new" body. I was afraid of being judged. It took my husband forcing to take me out for the day and buy me new clothes. What woman doesn't jump at the chance of her husband offering to buy her whatever she wants?! Seriously, what was wrong with me?! Well, we went to the mall. Where I had shopped a million times before. But this time was different. I used to just pull clothes off the the racks, try them on and they would fit. I loved spending hours in dressing rooms and putting adorable outfits together. It used to be easy. NOT anymore. I quickly realized that the "regular" stores no longer carried my size. Everything, even the largest size (which was a 13/14) in the stores that I went to were too small. When I would ask for the next size up, the sales associates would look at me and simply just say "Sorry, we don't carry anything larger." As a woman who has never had this problem before (or any woman for that matter) it is devastating. You feel like you aren't worthy enough to shop where everyone else does & you are banned to the "plus size" stores. Fast forward to a year later. I stopped drowning in the image of what I thought my body should look like & no matter what size I may be, I have learned to love and accept my body for what it is. I accepted my curves for what they are, I accepted the fact that instead of being the size 12 I was when I met my Husband, I am now a 16. Yes, I said it. A number that I have been ashamed of and have hidden behind, but NO longer. There is still progress to be made, but in the meantime I plan to embrace my new curves & to be confident with my "new" body. I have always been hesitant about ordering clothing online, in fear that it will never fit right, but I decided to go ahead and splurge & am so thankful that I did! Right out of the box, the top fit amazingly! It was snug in the right places & yet hid everything else that I have been so self conscious of. Kiyonna's clothing fits a woman's body, they flatter a woman's curves. 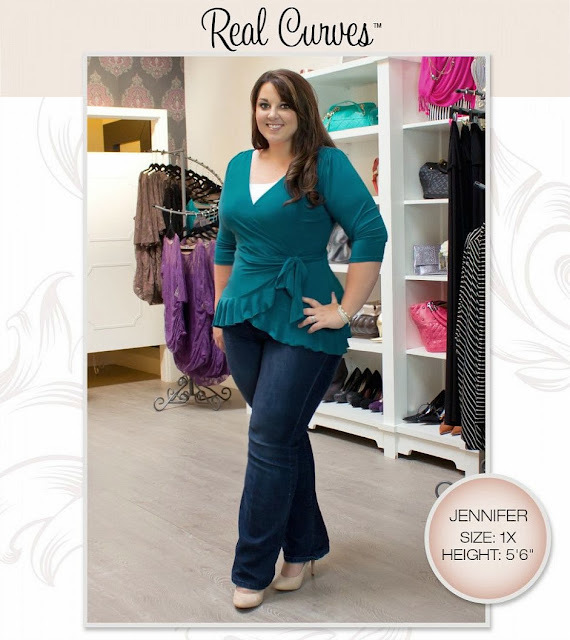 Yes, their clothing is an investment, but is SO worth it if your are a plus size girl! So thank you Kiyonna for making me feel beautiful again! Shortly after sending a little thank you to Kiyonna for their wonderful service and amazing clothing, I received the opportunity to "model" some of their beautiful clothing from their line for their website. I was blown away that they would choose ME, just an average stay at home mom! I am by no means a model and can usually be found behind the camera instead of in front of it. It was overwhelming walking into their Anaheim, CA showroom & being able to pick from whichever items I wanted to try on! Ultimately, EVERYTHING fit, it was one of the easiest shopping experiences I have had! I was one size (1x) and everything fit my body amazingly. Ashley (from Kiyonna) styled each outfit and chose which outfits to photograph. ALL of the ladies were so kind to make me feel so comfortable & confident in front of the camera. I was able to take away from the shoot a few of my favorites. My Kiyonna tops are now my everyday wardrobe "go-to" pieces. If you are a size 10+ I highly recommend that you take a look at Kiyonna, you will not be disappointed! Love your body, Love your curves. Thanks for sharing your heart about this. You are beautiful! I wish they had stores in Colorado. I've had bad experiences with ordering clothes online. Even if they fit...I sometimes don't like the way it looks. But I am definitely considering it. They have so many beautiful things. Another fun place is Torrid...it's from the Hot Topic family...for plus size. hey nice post mehn. I love your style of blogging here. The way you writes reminds me of an equally interesting post that I read some time ago on Daniel Uyi's blog: A Lifetime Isn’t Very Long . You look beautiful! Thank you for your honesty and your blog:)! But I've never commented. I went through a crazy time in my life a few years ago when I was in college (my parents divorced) and I ended up gaining some weight as well. I am also a size 16 (was a 10/12 in high school). I've been this way for a few years now, and I don't think I've "fully accepted it" I really enjoyed reading this post and your pictures! You are stunning, even as a size 16. Thank you for posting this and thank you for your confidence! You are so sweet and beautiful and that can not change with some extra kilos.Thank you for sharing your thoughts with us!